OpenAnesthesia™, sponsored by the International Anesthesia Research Society, was founded by Dr. Edward C. Nemergut and Dr. Robert Thiele. It debuted in July 2009 with the broad goal of advancing graduate medical education in anesthesia. Since its inception as an experimental project, OpenAnesthesia™ has grown to be a comprehensive resource for anesthesiology residents and physicians worldwide. OpenAnesthesia now offers both online and mobile education resources. We are dedicated to using cutting-edge technology and a modern approach to education to provide the best, most time-efficient continuous education that targets individual resident’s and physician’s strengths and weaknesses, and, of course, interests. Our goal, as from our inception, to offer an education system that is effective, engaging, and ultimately improves anesthesiology practice and patient care. 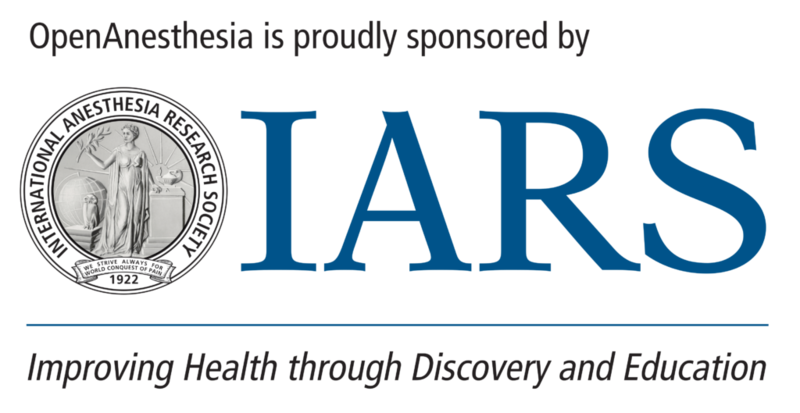 The International Anesthesia Research Society is a nonpolitical, not-for-profit medical society founded in 1922 to advance and support scientific research and education related to anesthesia, and to improve patient care through basic research. The IARS contributes over one million dollars annually to fund anesthesia research; provides a forum for anesthesiology leaders to share information and ideas; maintains a worldwide membership of more than 12,000 physicians, physician residents, and others with doctoral degrees, as well as health professionals in anesthesia-related practice; sponsors the SmartTots initiative in partnership with the FDA; and publishes the monthly Anesthesia & Analgesia journal in print and online as well as the clinical companion journal A&A Practice, published semi-monthly. OpenAnesthesia™ content is intended for educational purposes only. Reuse of OpenAnesthesia™ content for commercial purposes of any kind is prohibited. We will not release your email address to anyone.